An extraordinarily entertaining prequel to a fantastic franchise. as it is necessary the presence of selene and michael in this film, but the story they tell is entertaining although the characters are not so much the same, it is a very enjoyable product. So what is this? Another sequel to Underworld after Underworld: Evolution? No, actually. It's actually a prequel, with no Kate Beckinsale as Selene! But how is that possible? Well, it's because it's an origin story that is taken place before Selene is hunting for Lycans. Many centuries ago a werewolf battle known as Lycans are at war before Selene was born. And one vampire elder named Viktor had a daughter named Sonja and one adopted son named Lucian. Lucian escapes Viktor's fortress but is being whipped and imprisoned. And Viktor knows all about him and Sonja. Now Lucian has to go and rescue Sonja from Viktor and Lucian and the Lycans are at battle. Yeah, I can see why this is taken place and I can see why this is a prequel. Lucian is actually a bad guy in the first film and Tannis from the second film is the one who help Selene and Michael. Now then, I actually like this one because I kind of liked the idea of where it has sword fights against werewolves and castle fortresses. Don't get me wrong, I did like the Underworld fine despite it's pretnetiousness and I actually think that Underworld and Rise of the Lycans are better than each other now that is saying much. Underworld: Rise of the Lycans is an obscure film to a certain extent much like Underworld. Now that I've got that decent prequel film out of the way I am now ready to do a sequel with Kate Beckinsale returning as Selene. Stay tuned for that! "Underworld: Rise of The Lycans" is a good prequel that keeps the exciting action sequences and tells a good backstory. But i dont find this as fun as the other 2. Why not? I've seen the first 2. We could be slaves?! Or we can be Lycans?! Poorly conceived prequel to a mindless supernatural action series, it attempts to add pathos to the war's outbreak with a doomed love story badly riffing off of Romeo & Juliet. Not as entertaining as the first two installments. Rise of the Lycans showcases how the series is quickly wearing thin. Ótimo para os fãs ávidos em conhecer o início da série; mas como um filme é confuso e brega, assim como seus antecessores. Apesar de ser cinco cabeças responsáveis por esta estorinha, todas elas parecem não ter animo em produzir algo coerente e menos imaginativo. Under World: Rise of the Lycans is the third Under World movie but is a prequel to the first. This is by far the best Under World film altho it isn't saying much since the other aren't that good. This movie gets away from all that boring Matrix copy cat gun action and goes more with medieval sword action which is plus. Altho the plot is daily thin and generic as well as it seems a bit rushed and some characters aren't developed as properly as the should be this was an actual enjoyable watch even if it is has a simplistic plot. The characters are more interesting this time around and we get pretty solid performances from the cast. The setting is also fantastic. It has a really similar look to the battle of helms deep from Lord of the Rings which isn't bad at all and actually seems fitting of a vampire and werewolf shared world. The characters in this film like I said before are a bit under developed. It would have been nice if they spent more time with them seeing as a lot of character motivations and relationships seem forced and out of no where without proper set up. The final battle as well I really wish was longer. It started out really epic like it should but lasts only a couple of minutes and before we get to see enough Vampire vs werewolves medieval action the films over. Also there's a lot of contradictions in this movie which is pretty noticeable if your paying attention. Also you could say the films is kind of pointless since the first film already explains basically what this film does in its 90 minute run time but I'm personally glad they decided to do this film since It's the only one of the franchise I can actually sit through and enjoy. Overall tho this is the most watchable and interesting of the Under World films with solid performances as well as pretty good creature designs and has a rather interesting plot despite it being generic and simple. A lot of the good things about this film is due to pretty good world design and visually interesting set pieces but with a little more work this could have been even better. Over all tho 3/5 and this is being generous because I'm a pretty big werewolf movie fan and this is a type of werewolf movie I've wanted to see even tho the film as a whole probably deserves a lower score. A very good prequel with the original cast which makes a nice change in prequels, It was nice to see Michael Sheen back too, I enjoyed it just as much as the others, The action was very gory and entertaining, If you payed attention to the first two Underworld movies then you kind of know what is going to happen and when as literally the whole film is explained in Underworld 1 & 2 so it kind of takes the excitement out of some bits but it's still great and probably the best Underworld film to date. Very good but probably the worst in a brilliant series. Bill Nighy, Steven MacKintosh and Michael Sheen make this one worth watching, and it's good to see the series looking back to how the vampire/lycan wars started. 1/12/2017: A pretty decent prequel. The story was interesting and the action was good. And Rhona!! Why I chose to sit through this series? I'm still not sure. But I do know one thing, this series provides nothing more than some blood, guts, and an occasional cringe worthy romance. 'Rise of the Lycans' is the first and only in the franchise to not star Kate Beckinsale, though they tried their hardest to make it seem like she's in by putting a lookalike actress, Rhona Mitra, front and center. Their characters wear similar clothes and have similar makeup and characteristics. Only Mitra's character, Sonja, is poorly written and adds nothing new to the lore of this series. Really, this entire film can be described this way. It was the shortest film, until 'Awakening', and by far the thinnest in depth. Rotten Tomatoes sums it up as being indistinguishable and unnecessary. That just about defines this film to a pulp. We already had flashbacks and a brief history lesson in the previous film to the war between Werewolves & Vampires, and already exposed to how Viktor fits into the grand scheme of things. So, was there any need to make this film instead of a continuation with Selene and Michael? Absolutely not. To be fair, I think Michael Sheen's performance makes the film worth watching. The writing takes his character in a Romeo & Juliet direction with Sonja, Viktor's daughter, but Sheen easily outperforms everyone. 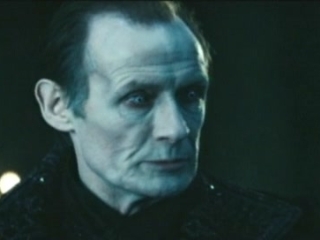 And yes, that includes Bill Nighy's once again over-the-top turn as Viktor. The reality is, this series has perhaps never tried to be anything more than a guilty pleasure for the blockbuster genre. There's some solid action, a well-realized performance from Michael Sheen, and a short running time. Okay, perhaps the latter shouldn't be a compliment for a movie, but I guess that's what Underworld gives us. Kill this series already...liked the first one only.